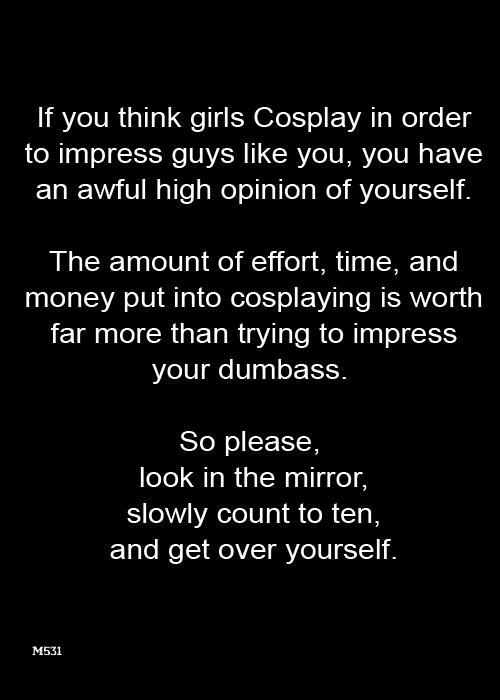 I now post this for creative ladies like Lauren, Raven, Riddle, Jenn, Jean, Alexia, Freddie and cosplayers everywhere. Some of these incredible creators I know. Some are total strangers to me. All of them are fans through and through, dedicating their time and talent to bring their favorite characters of comics, film, and television to life. And no, they’re not doing it to get attention, score dates, or lure you into a bed strewn with roses. These ladies—and the guys who also cosplay—do what they do for the love of the genre and for the love of those characters. They are also writers, gamers, and artists. If you believe this, stop this sort of sexism when you see it. Whether it is Dragon*Con, Comic Con, or an entirely new convention, this kind of idiocy needs to be called out. After all, that is what the Science Fiction-Fantasy-Horror community is all about — acceptance. Time we start practicing it.